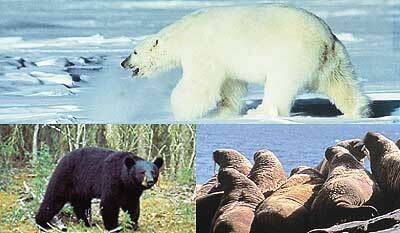 Bears and walruses are common hosts for trichinosis. Trichinosis from Alaskan wildlife is caused by a roundworm called Trichinella nativa. Lifecycle: The larvae of the roundworm grow and mate in the intestines of the host animal. The females deposit larvae that travel in the blood to other parts of the body where they form cysts in the muscle. Animals become infected when they eat meat with cysts. Trichinosis occurs in bears (black, grizzly and polar bears), wolves, foxes (arctic and red), wolverine, lynx, walruses, seals, and ground squirrels. In Alaska, trichinosis is common in many species and locations. Humans and dogs can also get trichinosis by eating infected meat. It may be possible to get trichinosis from consuming smoked moose ribs. What are the signs of trichinosis? Trichinosis is hard to detect when butchering because there are few signs. Larvae form cysts usually in the muscles of the jaw, tongue, and diaphragm. Cysts may not be visible to the naked eye. Animals may have swollen intestines with small bruises. Affected muscles and associated lymph nodes (glands) can be soft and swollen. You can get trichinosis by eating meat from infected animals that has not been thoroughly cooked. All bear and lynx meat should be considered possibly infected. Can I eat the meat? People can get trichinosis by eating infected meat that has not been adequately cooked. Meat should be well cooked (internal temperature of meat should be at least 160° F). Freezing meat does NOT kill the Trichnella species found in Alaska's wildlife. Smoking, drying, salting or microwaving do not always kill the parasites, only proper cooking or canning is known to make the meat safe to eat. Do not feed infected parts to dogs.